Taste of Summer | Oh, hello thirty. Summer seems to have really arrived in Edinburgh. Both of the past two weekends have been warm enough to support outdoor drinking. All of which led to me standing in the grocery store liquor aisle last night internally debating whether to buy a bottle of Pimm’s or a bottle of Campari. Now, Pimm’s is awesome and I’ll probably post my own Pimm’s Cup recipe here sooner or later. But last night, the gorgeous ruby hue of the Campari won out. Campari is a bitter apertif and, as such, it’s a bold flavor. A lot of people find it hard to, um, swallow, in it’s more undiluted forms (a Negroni, say, or an Americano). It pairs well with citrus so one approach for novices is to pair it with orange juice a la the Screwdriver. My suggestion, however, is just to build on the basic Campari and soda. I start with a lime, mint and sugar and muddle half a lime’s worth of lime juice, several mint leaves and about a half teaspoon* of sugar in the bottom of a highball or pint glass. I then fill the glass with ice and fill it with Campari and soda (two parts soda to each part Campari). Then I stir. The resulting drink is refreshing and pleasantly rather than alarmingly bitter. Yum. 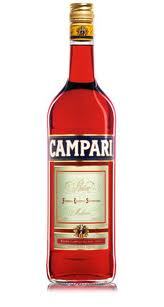 *Remember, I really like Campari. You can definitely add more sugar.